We can count with one hand the number of legitimate tastemakeres the latin hipster world has seen. Nacotheque was one of them. “Let’s make a Latin party music night like that of Nacotheque,” local Phoenix entrepreneurs have told me over the years. Every city has tried to emulate their spirit at some point. Amylulita and Marcelo Báez (aka Marcelo Cunning) set the example on how to party with Indie Pop En Español, making it cool before any of the blogs did. Most importantly, Nacotheque’s downloadable mixes provided the aughts with a taste that blurred social barricades. From their disposition at affording guilty pleasure, to their embracing of a nonchalant queerness, Nacotheque was crucial in the social equalizing of the new audience of Iberoamerican indie. There are no guidelines to following something like Nacotheque, but in the last couple of years Marcelo Báez found ways to keep himself active and current. He put the turntable aside and entered the world of music blogging. Whether goofing off on trends via Guanabee, or acquiring a critical boldness via Manero, I confess Báez is one of my favorite people on the Internet. While his labor might seem less shiny and relevant than his past, he’s maintained a level of curation and asserted taste for the common goal of us music commentators: cultural production. Báez is not stopping at tastemaker and blogger though, now putting his own cents as a musicmaking man. 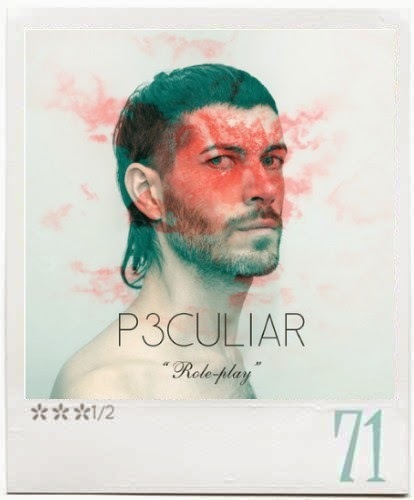 Under the moniker of P3CULIAR, Báez is embracing his past roles in music, keeping the faithful proposition of providing a broad audience with shameless and defragmented popular music. Role-Play, his first release, is in its essence, an ode to everything that’s populachero. Favoring cumbia amongst all the sounds he helped to establish as cool, Báez surveys the genre without appropriating its culture. This is a wise choice that consequently elevates him from the near-mockery of bands like Los Master Plus or Sonido San Francisco. P3CULIAR is still unable to escape its somewhat privileged conception. First single “Menea” (feat. Cakes Da Killa) is almost a bit too tailored to sound pedestrian, and yet it’s polished with luxurious synths that fade in and out of the scope, almost defeating the integrationist purpose. This doesn’t stop the song from being deliciously catchy, and it happens to be attached to a pretty memorable video. The other cumbia numbers are better accomplished because they embrace their bourgeois and condenchi nature. Album opener “Hazme El Amor” has an enchanting andean fabric to it you’d think Kali Mutsa is in it, while “Star” has such a strong anthemic proposition (gleaming sequencers, earnest lyrics) to call it cosmopolitan. The rest of the album is less exciting on paper. With the help of a female voice that sounds very much like that of María Daniela, Báez approaches techno pop with the same regard of affordability as he does with cumbia. Some tracks push the right buttons (the whimsical and macabre “Wicked,” and the rendition of Yuri’s “Yo Te Amo Te Amo”), while others feel obsolete as if they had been part of the Nuevos Ricos catalogue a decade ago. This is not to say Báez is holding on to the glorious days of Nacotheque. If Role-Play earns self-sustainability is because of Marcelo’s many cultural cultivations. Stick with the cumbia next time colleague.